Is This A One Day Wonder Like 1987? HomeBusinessIs This A One Day Wonder Like 1987? Today the intraday market crash was the largest since 1987, at the low the DOW touched 9,870 and was down 992 points or 9.1%. This crash happened in the same manner as the crash in 1987, with a currency melting down in the background. Then it was the dollar, today it is the Euro. Is this a one day wonder like 1987? NO! It is a continuation of the debt events that have been creating crisis after crisis since even before the year 2000 and are accelerating. Great risk remains as I’ve been warning. You are going to continue to see debt driven events circle the globe, and they are very likely going to lead to “other” events. You should be worried and you should be prepared. This is why it is so important WHO controls the money – and make no mistake, the private central bankers make ALL the money, not the government. WHO controls it is FAR more important than WHAT backs it! The solution? Sovereign money as would be produced under the provisions of Freedom’s Vision. Note that I am not showing you a stock market chart, I am showing you a chart that is directly related to DEBT, the root cause not just a symptom. 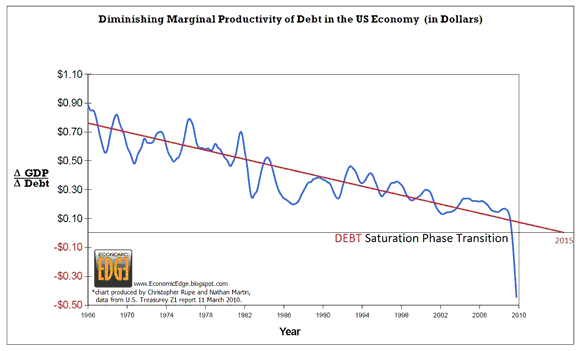 Once saturation has been reached, it is impossible to cure a debt problem with more debt. Sure, things can move higher for awhile, but it is (and it was) FALSE. This is not over folks, it won’t truly be over until the root issues of our money system are addressed. Today you had DEEP pocket money step into to stop the decline, it is a warning. Confidence has been eroding and that confidence may have just begun a phase transition of its own. That’s the way it goes. Now the markets are going to have to prove they are stable over the next few trading days. I’ll go over the technical picture later today or tomorrow morning. UPDATE: The Proctor & Gamble excuse is nothing but a rouse. Below are two charts, one showing the S&P futures (/ES), the other showing PG for each minute. It is clear that the market headed down FIRST, PG second. We are a sick and delusional society that cannot even accept what we are doing to ourselves, SICK. CNBC should be sued and they should be removed from the air. Nathan A. Martin is President of Wingman Investments, LLC, and author of the book Flight to Financial Freedom – Fasten Your Finances. He sees people, both young and old, facing a new era where they are forced to be responsible for their own financial success or failure. His message is clear; become financially literate or be a victim of the external forces that are impacting everyone. Nathan possesses an undergraduate degree in Professional Aviation and Business as well as a Master’s degree in Aviation Management and Operations. A former Air Force and retired airline pilot, his flying took him the world over participating in many operations including the invasion of Panama, and combat time during Operation Desert Storm. Experience has come over 26 years of flight - logging more than 12,000 flight hours both civilian and military, and as the owner of a corporate aviation management company whose focus was aircraft efficiency. Influenced by his parents entrepreneurial activities, Nathan began his business and investment training early in life and has used that knowledge every step along the way... from business school to his own corporations and personal investments.